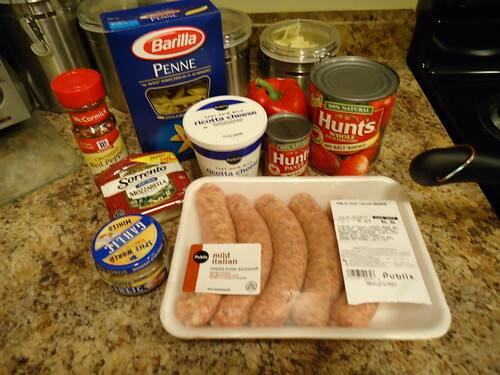 i wish that i could be italian… making meatballs, homemade pasta and cannolis filled with marscapone cheese. but i’m not. i was, however, elated when i received “the italian issue” of the food network magazine a few months back. it was full of all things italian and made me a very happy italian wannabe. anyways, this is a really fun dish to throw together. i thought that i was making it for two, by significantly cutting down the original amounts listed in the article. let’s just say that moderation isn’t my strong suit when cooking. i was going for a 8″ square dish, but it made enough for a 9×13″ pan and we had it for leftovers and lunch. a few times. it was still very delicious! this dish is also very customizable, based on your own personal tastes. my choices are in bold, below. bring a med pot of water to boil. cook pasta for 2-3 min. less than the label directs. drain. in a large skillet, heat evoo over med heat. add garlic and a pinch of pepper flakes. cook until garlic is golden. add the tomatoes/paste, crushing tomatoes with your hands as you add them. 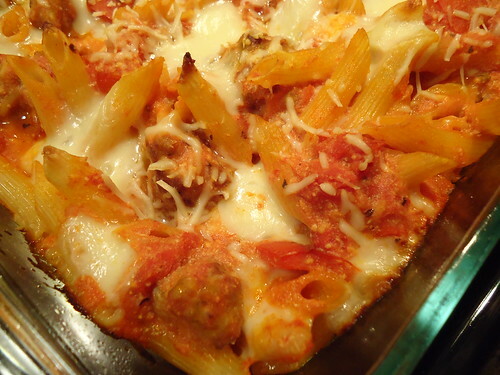 (it is messy, but adds a nice chunky tomato taste that is worth it!) invest in a red apron. add water, basil and sugar and simmer, uncovered until the sauce is thickened for about 15 min. or the amt. of time it takes to prepare the mix-ins. add your choice of mix-ins to the sauce. toss the pasta with sauce and half of each cheese. spread in a greased 8″ square baking dish. sprinkle remaining cheese over pasta. bake, uncovered for about 15 min. or until browned.